Being mindful means being awake and aware. 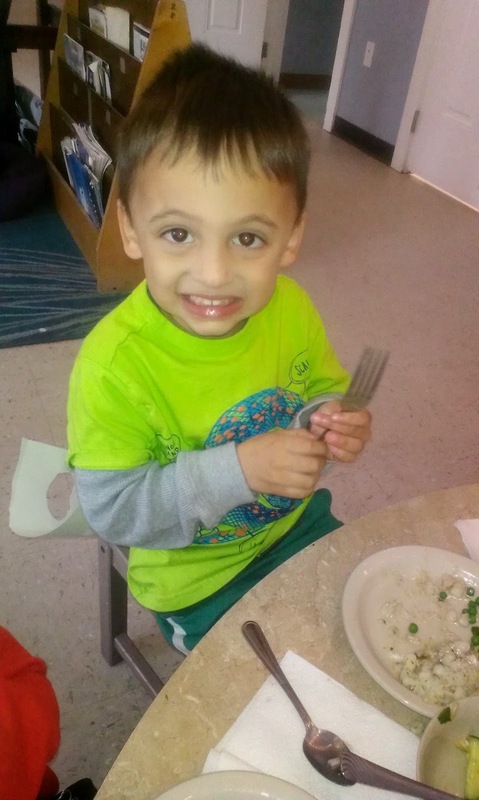 In this blog, I will talk about things to be aware of around your child and eating. 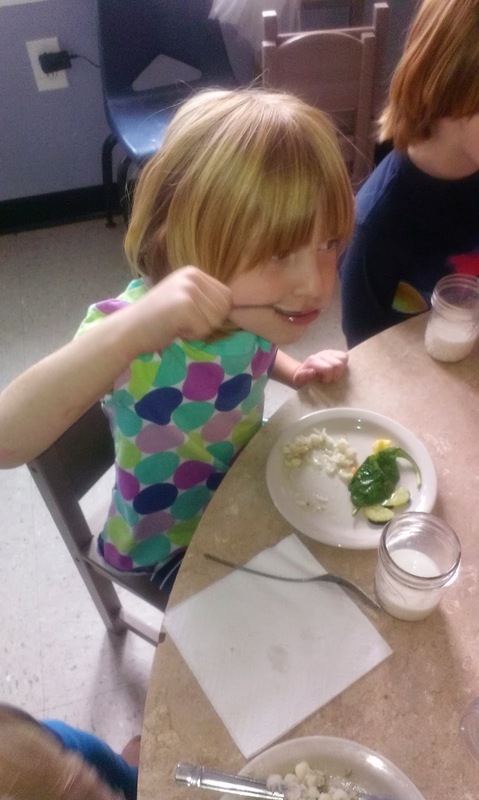 Imagine having a personal chef that creates amazing, diverse, organic meals for you every day (like we do here at The Little School). Imagine you are eating with 4-6 of your friends at a table. After serving yourself some food, you probably begin various conversations and lose yourself in social interaction. At the end of the day, you probably don't even remember what you ate. You eventually probably take for granted the wonderful food placed before you. You have succumbed to the very human traits of multi-tasking and habituation. Now imagine you could re-learn your eating habits from scratch. Would you teach yourself not to like healthy food? Would you teach yourself to eat as fast as you could and to keep eating even when you were full? We all have the opportunity to start fresh with our kids. It is up to us to take this opportunity and use it. Learning to feed and nourish our bodies is a part of growing up. It is a part of being aware of who we are. Different cultures have different eating habits. Family values play a big role in eating as well. Let's take a moment to think about what we are teaching our children about food. Eating healthy is not just about the food pyramid. It's about learning to listen to and respect our bodies. Children can learn this from a very young age. What different ages are learning at meal-times? Infants rely much on instinct when it comes to eating. They cry when they feel hungry and stop eating when they are full. We can help them become aware of this as they develop by verbalizing what we notice. As infants are drinking milk from their bottle, we can talk to them. "You are drinking that milk fast. You must be very hungry.... I notice you are playing with your bottle, is your belly full?" to eat and explore her food. 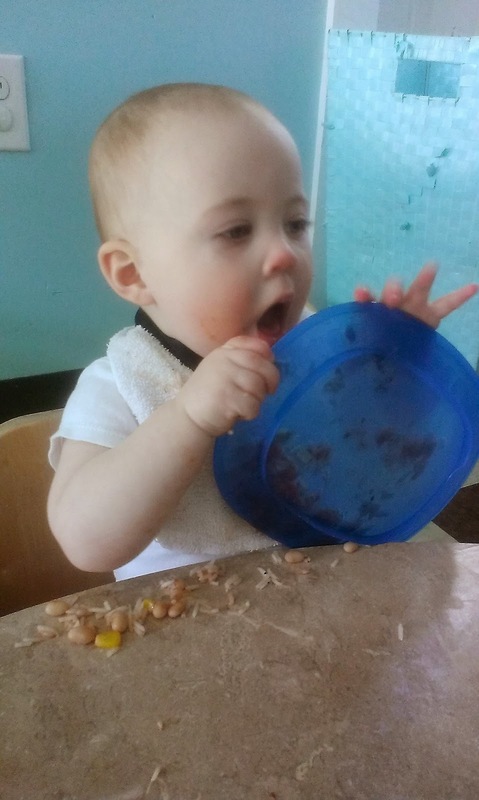 One-year-olds are learning to use their fingers and to eat finger-food. They are learning to try foods for the very first time. They are learning about the textures and tastes of food. They may be slow to eat (and messy) but the experience and skills they are learning will help them learn to feed themselves and appreciate food in the long run. 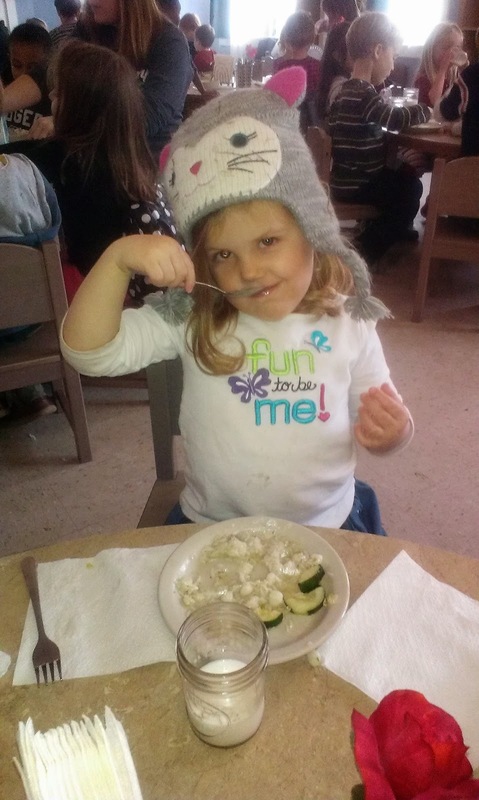 2-5 year-olds are learning self-help skills and how to eat in a social situation (e.g. table manners). They are playing with boundaries and testing expectations. They are learning how to be independent beings with preferences of their own. When we respect their preferences, they will learn to respect their own feelings and intuitions. As someone who has taught all of these age groups, I know it is hard to remember where these children are at in their development when we are trying to get through meal-times in a timely manner. We all have a schedule in our heads that we are trying to stick to. But by taking a deep breath and slowing down (this is the mindful part), we can be the example that these kids learn from. We can model healthy eating habits and help these kids develop healthy relationships with food and their bodies. Preparing meals and plates fully before sitting down to eat so that you can eat with your child instead of being the "servant" who feeds them. Allow kids to help themselves and be a part of the preparations as much as possible. Let them set the table and bring their plates to the sink when finished. Remember, they are capable beings and with a little support can do much on their own. Demonstrating trying new things. Talking about the food you are eating where it comes from. Who prepared it? Talk about gratitude...for all the things that brought the food to the table; the farmer who grew the vegetables, the cook who prepared it and eventually, with older kids, the animals who gave their life so we could eat (this is a hard one for me and for many who may not want to dwell on death while eating and can lead to some very intense conversations, but good ones). Focus on the food and the act of eating rather than small talk which distracts us from the experience of eating. Talk about how our bodies feel before and after eating. Talk about how food gives us energy and what different foods do for our bodies. Encourage trying new things more than once before deciding whether we like or don't like a food. Talk about how different people like different things and that's OK. Kids often succumb to peer pressure and when one child says he/she doesn't like something, others will agree. Focusing on choosing for one's self is a real learning opportunity here. Avoid your own preconceived judgments about food. 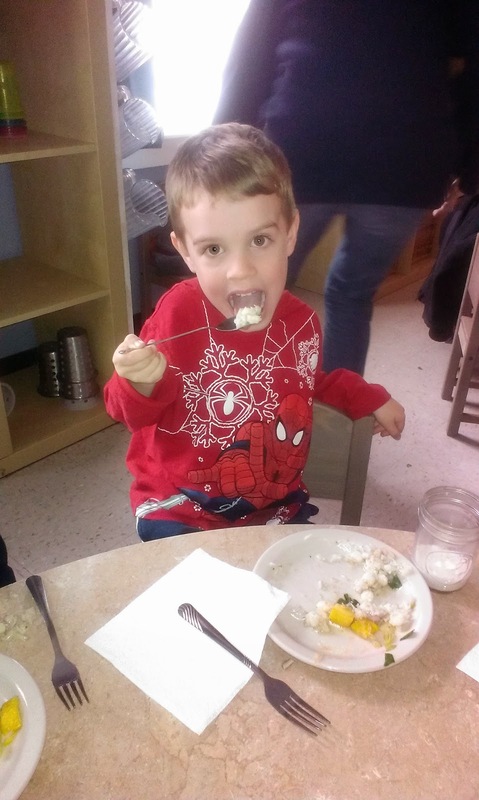 Just enjoy being a part of your child's learning experience about food. Respect their opinions. If they don't like something, don't force them to eat it. Allow your child to eat at their own pace. But recognize cues that they are finished. You can also bring back their attention to their food and eating if they get distracted. See what happens when you try some of these things. Part of being mindful is being curious. And always be gentle with yourself. Parenting (and teaching) is hard work. With loving kindness, acknowledge that you are doing the best that you can. As you let go of your tension, your kids will respond. Just try it and see! And if you are already doing these things, wonderful!